The island, which sits where the Leyte Gulf meets the Pacific Ocean, is a 2-hour boat ride away from the municipality of Guiuan in Eastern Samar during good weather. Sulu-an, an island 39 kilometers away from the municipality of Guiuan, Eastern Samar, rests on an area where Leyte Gulf and Pacific Ocean meet. The island is a good 2-hour boat ride away from the mainland during calm weather. On some days, it could be longer, or even not accessible by boat. Having endured countless weather disturbances, from Low-Pressure Areas (LPAs) to super-typhoons, residents are well aware that something’s going wrong with the environment. As the first barangay hit by Super Typhoon Yolanda in November 2013, residents of Sulu-an vividly remember the onslaught of the deadly typhoon, its strong winds and storm surges that destroyed their houses. It’s probably their ability to observe as well as the deep understanding of their natural surroundings that helped them prepare for a catastrophic event such as Yolanda. The 14-hectare island, home to 1,500 people, reported only a single storm-related casualty at that time. “Nag-uulyanin,” is a word that best describes the climate in Sulu-an, according to 38-year-old Lilybeth Badar, similar to one who is becoming forgetful. The weather has gone awry and climate patterns have gotten unpredictable, particularly after Yolanda struck, according to residents of Sulu-an. 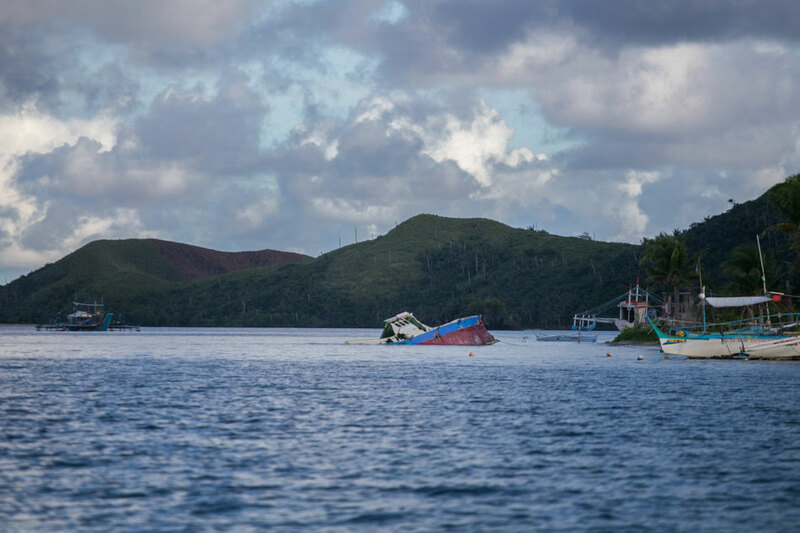 A motorboat, which was destroyed during Typhoon Urduja in December 2017, lies submerged on the shallow part of the Pacific Ocean in the island of Sulu-an. As the eastern most island of the Philippines, Sulu-an has endured countless weather disturbances. They know it will take time before the island recovers, after centuries-old trees, including coconut trees, were uprooted by Yolanda’s 315 (kilometers per hour) kph gusts and winds, thus making summer seasons more unbearable because of the sweltering temperature. 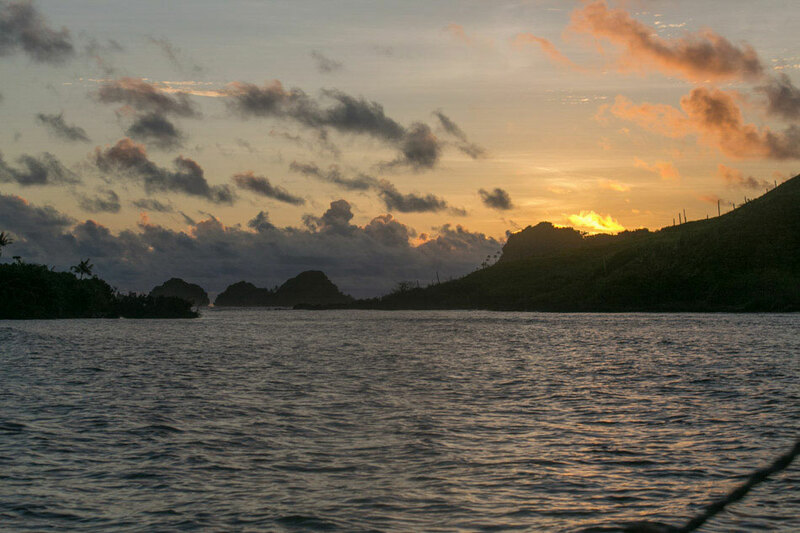 For Sulu-an residents, the increasing frequency of unpredictable weather conditions and changing climate patterns are proofs that climate change is indeed real, no experts’ advice needed. Narrowing beach fronts and increasing sea surface temperature substantiate studies made by experts from the Visayas State University on the slow onset of climate change in the region. Josefina Darang bakes bread using a kiln fueled with dry woods. Some livelihood on the island still depend on old but time-tested methods. An all-women team, Sulong Sulu-an members adhere to the popular Filipino adage, “Ang ina ang ilaw ng tahanan” (A mother is the light of a home), ironic for residents of an island where the lack of electricity poses a challenge to them and their families. Just helping their children with school work is difficult, especially to those with impaired vision, since sunlight goes out as early as six o’clock in the evening. Students are only left with kerosene lamps to light the rooms as they study. 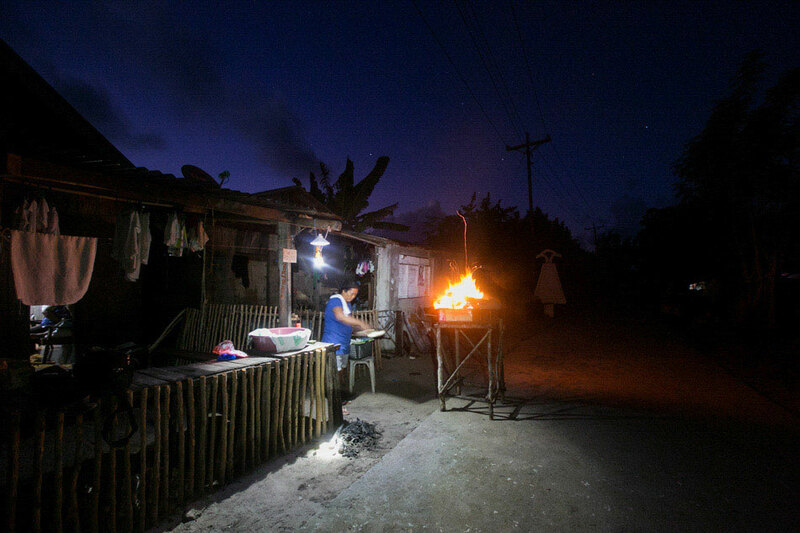 Given its geographical location, the island has been deprived of a steady supply of electricity. For years, residents have waited for the completion of an island-based, diesel-run generator under the Small Power Utilities Group (SPUG) Project of the National Power Corporation (Napocor) and Eastern Samar Electric Cooperative (ESAMELCO). Residents were introduced to the viability of solar energy after receiving solar-powered lamps distributed by the different organizations as part of Typhoon Yolanda relief efforts. To strengthen its livelihood initiative, Sulong Sulu-an proposed the establishment of “Tindahan ni Nanay” and invested on a solar freezer that would help them produce and sell ice for residents, particularly for those involved in fishing. Freshly caught fish, which are easily perishable, would last longer with ice as they await transport to Guiuan markets. In the past, residents usually dried their catch of fish and squid to avoid wastage. These were then brought to the mainland for selling. Participants check the capacity of a solar beacon during the Solar scholars training in Sulu-an. In 2015, the Institute of Climate and Sustainable Cities (ICSC) Tacloban-based RE-Charge team helped set-up solar street lights that illuminated taps stands, installed as part of the water, sanitation and hygiene initiatives of the post-Yolanda rebuilding effort. In the following years, the group continuously supported community efforts in utilizing renewable energy through different programs, such as the “Access to Better Energy” project, in partnership with Christian Aid. They had a procurement mechanism to install Solar Home Systems. It was an offer difficult to resist in a community deprived of a regular source of energy. They had easy payment terms of 13 pesos per day or 91 pesos per week for 2 years. This was cheaper than paying 5 pesos per day to light up a single light bulb. ICSC also organized a Solar Scholars training to help members of Sulong Sulu-an better understand how solar energy works. The training provided basic and technical skills in terms of selecting appropriate lighting fixtures and appliances fit for solar power systems for their daily consumption. The scholars also committed to assist residents on basic installation and trouble-shooting requirements. In addition, the solar scholars were also trained in using Solar TekPak, a portable solar energy set, that would provide light and operate important medical instruments during emergency scenarios. These initiatives developed into a bigger push to make Sulu-an as the “renewable island capital” of Guiuan under the Small Island Grid Energy (SIGE) project based on Resolution No. 16 of Barangay Sulu-an and approved by Guiuan Municipal Mayor Sheen Gonzales. 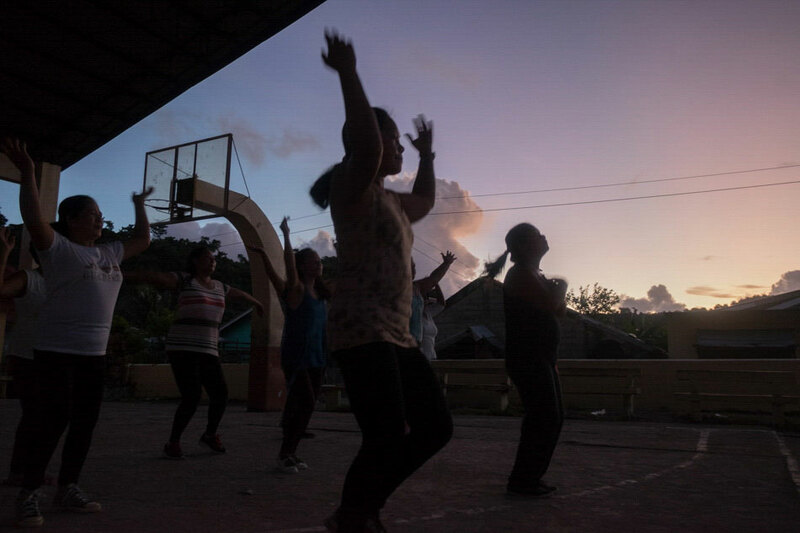 Women residents of Sulu-an enjoy a good Zumba session using a solar-run entertainment system. The island of Sulu-an is a microcosm of Philippine society, and Sulu-an’s resolve to face and overcome their challenges is a step towards ensuring a better environment for their children, their families and their community. It could be the Waray’s optimism which gives them confidence in the things they work on. Exemplifying resiliency and sense of community, they are not bothered by what they lack but are focused in finding solutions and by maximizing what is available in the island. The spirit of Bayanihan is very much alive in the island. Residents take pride on how each resident contributes when help is needed, never disregarding small contributions. All help matters. They overcome challenges with a big heart and smiles on their faces. A squall passes by the Leyte Gulf as seen from the island of Suluan. It will take time before the island fully recovers after centuries-old trees and coconut trees were uprooted by Yolanda’s 315-kph gusts and winds. Locals dependent on farming and copra harvesting were forced to rely on fishing or other ways to support their families. Some residents left their houses after Typhoon Yolanda hit the island in 2013. Declining fish catch has also become a big concern for fishermen like Rene Basedes, with the “Amihan” (northeast monsoon) and easterly winds extending to the summer months when calmer seas are expected. Most fishermen are forced to navigate farther to have a sufficient catch to support their families. Bad weather and rough waves make it nearly impossible for the locals to go out fishing like they used to, affecting the residents’ livelihood. A family swims to cool off from the sweltering summer heat. A mother and child protect themselves from the sun as the summer heat becomes more unbearable, according to residents. A boy plays along the shores of Sulu-an island. Residents noted the narrowing of Sulu-an’s beach front, which they observed months after Typhoon Yolanda hit the area. 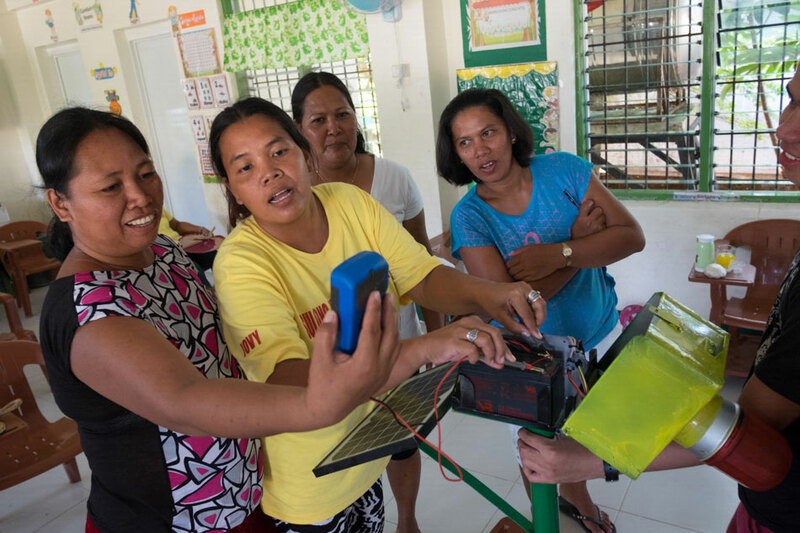 Barangay health worker Jocelyn Naing demonstrates how her family uses improvised lighting systems using alkaline batteries, PET bottles and white sand before she invested on a Solar Home System. It lights up their home, which has a portable TV for entertainment. Alma Latina, president of Sulong Sulu-an, attaches the wire to their solar appliances for recharging. Josefina Darang, recipient of a Solar Home System, prepares the dough for her bread business in Sulu-an. The solarization initiative had 47 recipients signing up to procure the Solar Home System, which includes a solar panel and a battery that would energize three 300-lumen LED lamps and a 9-inch table fan. Solar scholars listen as a volunteer from the Institute of Climate and Sustainable Cities explains how to check the capacity of solar energy systems. The entry of solar electricity in island allowed the residents to watch their favorite TV shows the whole day. Members of Sulong Sulu-an join other solar scholars as they attend a training on how solar freezers work. The freezer will be used to produce ice for residents involved in fishing, which would make their catch last longer during transportation to Guiuan. Participants share a light moment as they listen to a lecturer during the solar scholars' training in Sulu-an. Solar scholars test the Solar TekPak donated to the community, which they can use to operate lights and other medical equipment during emergencies. Members of Sulong Sulu-an gather at “Tindahan ni Nanay,” which sits in the center of the community for easy access.